Kuhmo is ideal for wild animal observation and photography. Especially the populations of large carnivores are vibrant in Kuhmo. 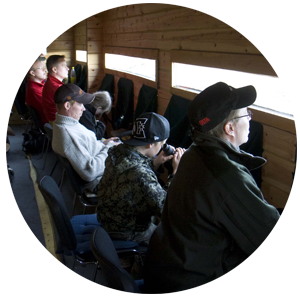 In addition to large carnivores, Kuhmo offers plenty of other areas of interest for observation and photography. Via the menu bars, you can browse our selection and find further information on when and how photographing can be done. The hide we use for observing the wild animals rooms 12 persons. Furthermore, there is a dry closet in the hide, along with beds for resting. In the hide, you can observe and photograph the wolverine and bear. If you are very lucky, you can even spot the wolf. We offer several hides designed for photographing wild animals. They are in various locations, depending on the chosen animal and background. The hides a fully designed for photographing, and they room 1-2 persons. The hides are made of wood or textile. Some species can be photographed without staying in a hide. At such time, photographing is done under the careful instruction of a guide, so as not to disturb the observed animal.